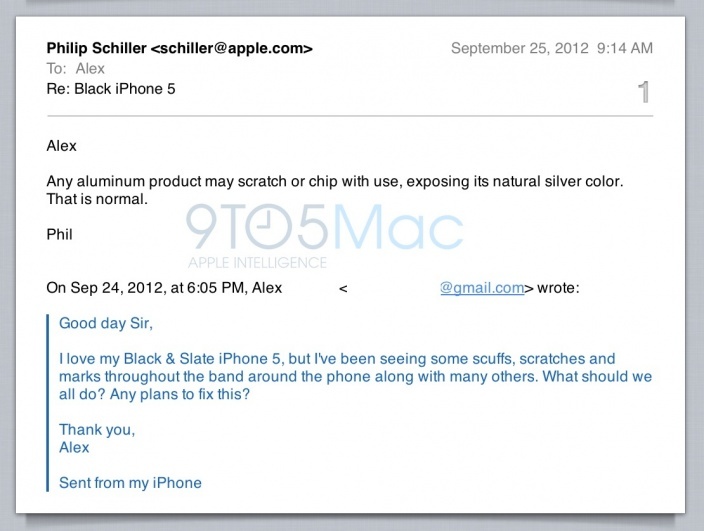 The growing “scuffgate” controversy surrounding the susceptibility of the new iPhone to scratches and chips has received further fuel after Apple’s Phil Schiller stated in an email response to an iPhone 5 owner that scratching or chipping of the product with use was “normal”. Since the retail launch of the iPhone 5, concerns and complaints about the iPhone 5’s tendency to scratch and chip more easily than previous models have poured in, with one thread on the subject of scuffgate on MacRumors stretching in excess of 140 pages. A poll on the forum has revealed that a large number of people have experienced the issue, with over 36% reporting that their black iPhone 5 was scuffed before they even got it out of the box. “I’ve been seeing some scuffs, scratches and marks throughout the band around the phone along with many others. What should we all do? Any plans to fix this?”. While the aluminum unibody of the iPhone 5 holds up to drop-testing much better than the glass backplate of the iPhone 4/4S, durability testing has shown that the iPhone 5 scratches much more easily than its predecessors. 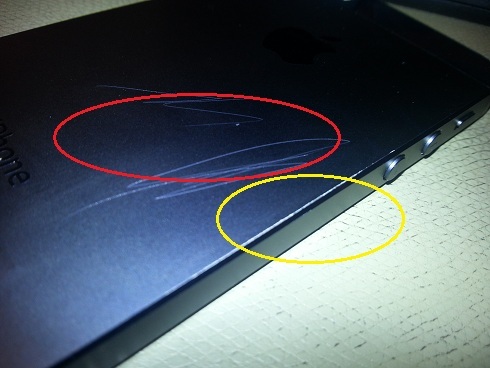 The majority of “scuffgate” complaints have been directed at the black iPhone 5, and it’s not clear whether the rear anodized backplate of the black iPhone 5 is physically more susceptible to wear and tear than the white model or if scratches are just more noticeable due to higher contrast. The chamfered edges of the iPhone 5 are amongst the most noticeable of design changes in the new iPhone, but they are reportedly the source of a lot of scratches and scuffmarks that wear away their anodized coating and reveal the underlying metal. A YouTube video posted by iFixit and demonstrates how easily the iPhone 5 can be permanently scratched with everyday items, like car keys or a steel ring. While the increased susceptibility to scratches has been a source of frustration for many new iPhone 5 owners – the solution is still simple and cheap: a case. Do you have an iPhone 5? Have you already got scratches? Share your experience in the comments below.